BMW i8 information: everything you need to know if you own it, are thinking of buying one or just want to find out more about the range-topping hybrid sports car. Click on the links below for all of CAR magazine’s news, reviews, videos, scoops and spy photos of the i8 car range. The BMW i8 was the first product of Munich's Project i - a drive to more sustainable, electrified cars. It arrived simultaneously with the i3 supermini, and both feature high-tech carbonfibre construction and a ground-up rethink of how mainstream cars should be built. 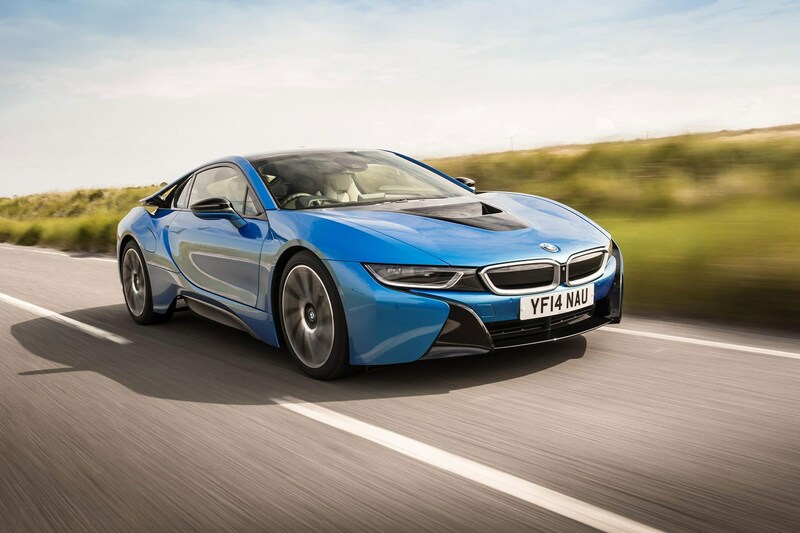 The i8 therefore has no conventionally powered version available and comes only as a range-extender hybrid. At present, it's tin-top coupe only, although BMW has teased a roadster i8 concept version. For more information on the BMW i8, click on our further stories on the links below. Prepare to be amazed by the BMW i8. It's not like any other Beemer we've ever driven - and you'll know that from the moment you first clap eyes on its low-slung, wedgy silhouette. It's manifestly made from lightweight carbonfibre, visible as soon as you open the cool, swivelling doors. It's a bit tricky to climb onboard (think Lotus difficult) but once you're inside you'll nestle in a focused, futuristic cabin, ringing to the sounds of electro beat. There's a curious lack of high-tech gizmos (you actually have to use a key, for heaven's sake!) but you'll forget the lack of some creature comforts the moment you thumb the starter button and set off. This is a PHEV, so there's a tiny 1.5-litre three-cylinder engine from a Mini mounted amidships complemented by electric motors driving the front axle; it's capable of up to 75mph on full EV power mode and the ECU juggles drive between each axle and power source. Is it a proper Porsche 911 rival? Yes, if you can stomach the new-fangled techfest motive power - there's even a pair of minuscule +2 rear seats, just like in the Lotus Evora or Ferrari Mondial. Pricey, is it for early adopters only? Watch the new BMW i8 on test - dancing on ice!